The Services Portal is the place for you to manage your ProspectSoft solutions with ease. 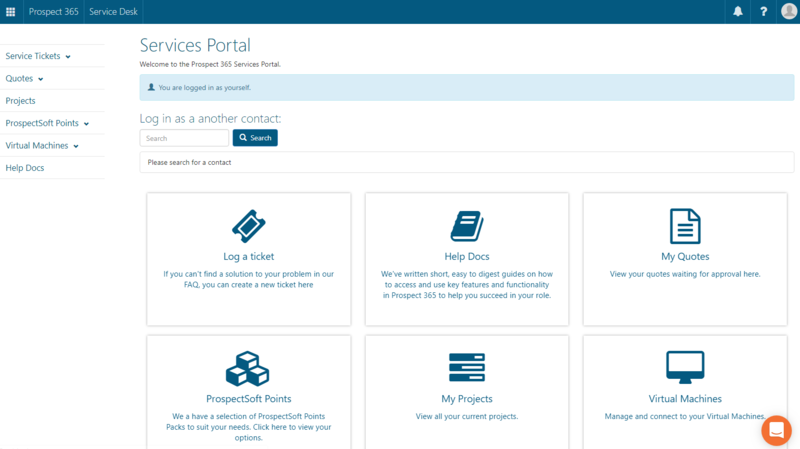 Accessing the Services Portal is simple - just log in using your normal credentials at services.prospectsoft.com. You can navigate your way around the Services Portal by using either the tiles in the centre of the page, or the drop-down menu items on the left-hand side. Quickly Log Service Tickets - Something gone wrong? Log a ticket online with our Service Desk using our intuitive filtering process to identify the issue. Here, you can even attach screenshots to help us resolve your issue more quickly. Help Docs - We've written short, easy to digest guides on how to access and use key features and functionality in the Prospect 365 solution to help you succeed in your role. Review Outstanding Quotes - Visit the 'My Quotes' section to review and approve any quotes that have been prepared for you by a member of the ProspectSoft team. Monitor Points Pack Spend - Paid for a recent project with ProspectSoft Points? Go to the 'ProspectSoft Points' section to see exactly what points were spent where with our itemised list of time used, and view how many you have left to use up. Greater Project Transparency - Get live updates on the progress of your project with a click of a button. See who is dealing with your project right now, and get precise details about its status by navigating to the 'My Projects' area. Access Virtual Machines - Here you can log in to a Virtual Machine if a member of the ProspectSoft team has requested you to do so.